Everyone knows that Hollywood's take on history is rarely accurate or truthful, especially when it comes to tales of how the West was won. Born around 1831 in what is now South Dakota, Sitting Bull was a chief and holy man who united all the Lakota tribes in their struggle for survival on the northern plains. Widely respected for his courage, leadership and insight, he brought together the Lakota, Cheyenne and Arapaho in opposition to the U.S. government in 1876. He also refused to settle onto reservations after an expedition led by George Armstrong Custer confirmed that gold had been found in the Black Hills. 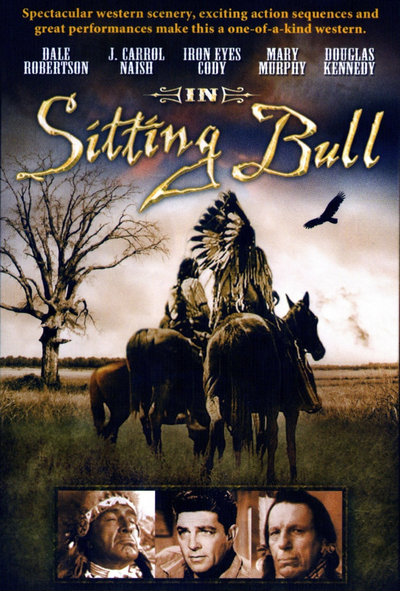 In this version, Sitting Bull labors to keep the peace between his nation and the United States, while the "bad guys" are portrayed as loose cannons on both sides: George Armstrong Custer (Douglas Kennedy), who was, of course, famously wiped out at Little Big Horn, and the warrior Crazy Horse (Iron Eyes Cody, who also served as technical advisor and designer of the Indian costumes).